AKG announces N5005 in-ear headphones, yours for £1000 | What Hi-Fi? High-end in-ears isn't new territory for AKG - way back in 2012, its £1000 K3003i in-ears managed to drop our jaws and rack up a five-star rating. 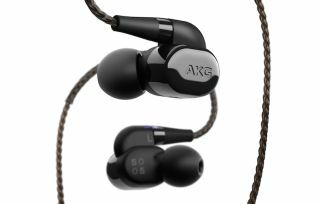 Skip forward five years and AKG has a very successful N-Series of in-ear headphones. Up until now, the most expensive pair in the range has been the Award-winning N40s, which will set you back the best part of £350. The N5005s up the ante with scratch-resistant, high gloss black ceramic earpieces. Each pair carries its own unique serial number and is Certified for Hi-Res Audio by the Japan Audio Society. The headphones use a hybrid of the company's One Dynamic and Quad BA drivers which amounts to a five-way design. You can also tune the sound to suit your own musical taste by swapping around the four interchangeable sound filters that come as part of the package. These are labelled Bass Boost, Reference Sound, Semi-High Boost and High Boost. Also included in the box are two sets of cables, different sizes and styles of eartips and there's even a Bluetooth dongle so you can swap a wired connection of eight hours of wireless playback if you so desire. The headphones will hit AKG.com and select stores in Spring 2018. What are hi-res audio headphones? And do they sound better?